Jeezis. This is why we can't have nice things. 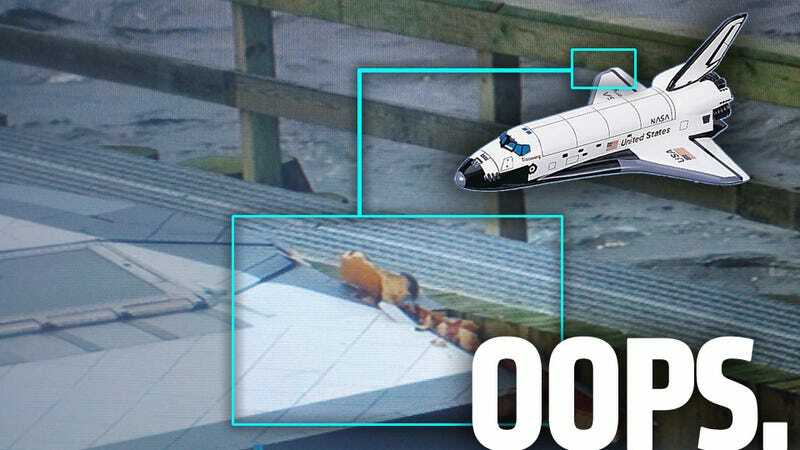 After the prototype Space Shuttle Enterprise was flown spectacularly into New York a bit over a month ago, yesterday it was just a touch less spectacularly floated on a barge through New York Harbor for temporary storage in New Jersey. There it will wait until its permanent home aboard the Intrepid is ready. En route, however, the orbiter was treated to that most special of New York welcomes, the fender bender. The barge driver, possibly unused to hauling gigantic spaceships, rammed part of the Enterprise's wing into a dock. Oops. The damage to the right wing seems to be the rear side of the wing, with (what would be on a real shuttle) the carbon-carbon wing edging sheared off. Since it's never destined to fly again, the damage is purely cosmetic. But, still. That shuttle was a gift. Keep this up, and let's see if NASA gives you any more spaceships. Thankfully, the damage to the dock appears minimal.